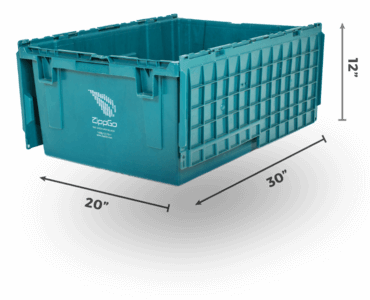 Instead of buying cheap moving boxes for your San Jose move, save money by renting plastic moving boxes from ZippGo with free next day delivery. You can place an order in a few minutes on our website or by calling our toll free number (800) 723-7017. Forget about the stress of going to a big box store, buying heavy flat cardboard boxes that require finding room in the trunk of your car, and the mental and physical strength to lug them into your house once you arrive home. To make matters worse, you'll have to spend hours building boxes fussing with sticky and messy tape. Instead, rent moving boxes from ZippGo and we'll bring them right to your front door in San Jose. It can't get any easier to pack up your belongings. We have three different box sizes so you can fit all your books, kitchen items, and even blankets and pillows. Our boxes will arrive assembled so they are ready to be packed and they never ever need tape (how awesome is that?). 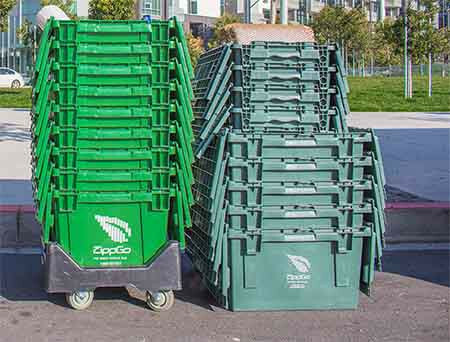 Plus we carry a full line of green moving supplies San Jose customers have come to love including eco-friendly bubble wrap, packing paper, reusable glass dividers, and reusable dish dividers. 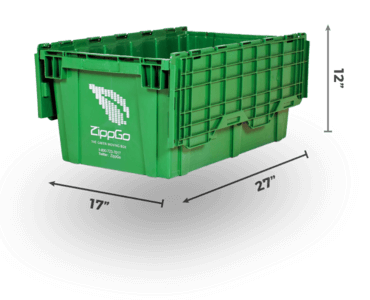 ZippGo's moving boxes complete flip the dreaded experience of moving and almost makes it fun! What Fits In The Boxes? 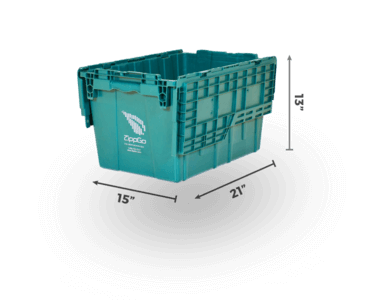 Since your life isn't a one size fits all, ZippGo offers three different plastic moving box sizes: Medium, Large, and Extra Large. 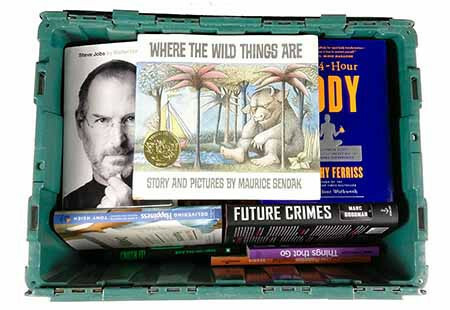 Use our Medium Box to pack your books and other smaller but heavy items. Use our Large Box to pack your clothes, items from your kitchen like pots, pans, glasses, plates, bowls, and silverware, and most other items. Use our Extra Large Box to pack your larger but lighter items like your blankets and pillows. 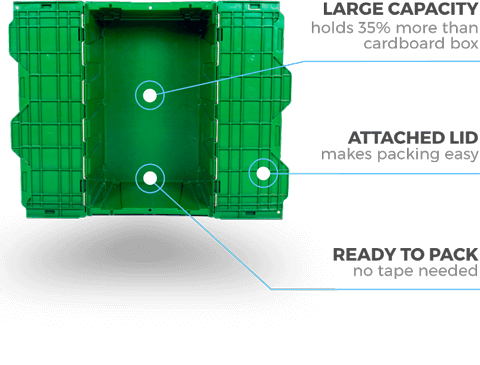 Our green moving boxes are delivered in San Jose with attached interlocking lids that are super simple to close and ensure your belongings won't fall out during the move. We also provide free box labels so you know what is in each box after you pack it and a four wheel box dolly to make loading and unloading the boxes a breeze. When using ZippGo moving boxes San Jose customers will save money when they hire a moving company. 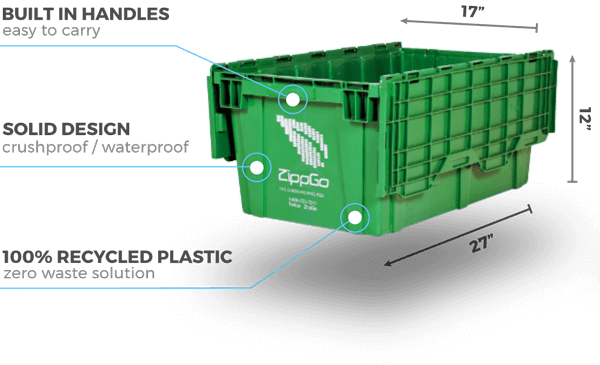 ZippGo's plastic moving crates uniform design makes them easy to stack and load on a dolly and load into the moving truck. Cardboard moving boxes create delays because they are top heavy, cannot be stacked very high because of weight and crushing issues, and because they can easily tip over both during loading and in the truck. Moving company employees will often spend a significant amount of time in the back of the moving truck organizing the stacking of cardboard boxes. With movers charging upward of $150/hr, even saving 30 minutes saves you a good amount of money. "Had to make a last minute move from my apartment and the last thing I wanted to deal with was scrounging for cardboard boxes! Did a search on Google not really knowing what I was looking for and found ZippGo! Never knew you could rent plastic boxes for your move. These green boxes were life changing for my move and I can't imagine moving again without them. The delivery guy was super nice and came right on time. I'm done with cardboard forever!" "Thank you! Again, great service you're offering!! You should market/partner with realtors (we told a few and they love it!). I'm always happy to support small business as well as new innovations!" "Zippgo was amazing. Great quality crates and EXCELLENT customer service. I made an order online and they delivered the crates on time. I was helped by Ash and she was incredible from start to finish. The customer service was fast and they were super accommodating. The crates made our move go much more smoothly. They're very sturdy and they hold a lot of stuff. They stack well and fit nicely in the car. The only thing is I just wish the box handles weren't so sharp! If it's heavy, it can hurt your hands, especially after a long day of moving them. The pickup didn't go so well. I'll spare you the details, but the important thing is they handled it really well, and again, just really accommodating and helpful all around. I'm very impressed with the customer service." Free Next Day Delivery in San Jose!